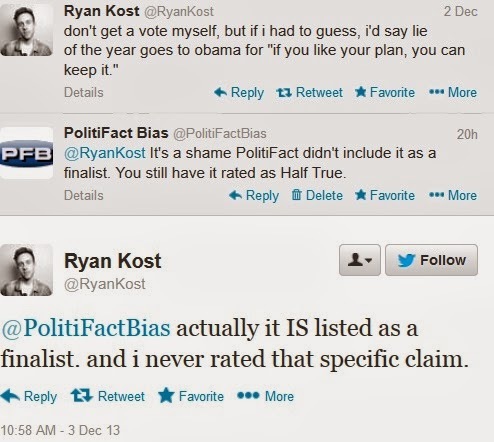 On Monday PolitiFact announced the Lie of the Year nominees for 2013. Twitterers went to work spreading the not-so-shocking news: Obama's claim that "If you like your health care, you can keep it." was a finalist. The lie is pretty obvious by now and the claim certainly fits PolitiFact's criteria for Lie of the Year. So what's the problem? It's not actually on the list. Let's remind readers that PolitiFact's harshest rating of Obama's most notable deception on ObamaCare is, in fact, "Half True." As Sean Higgins chronicled over at the Washington Examiner, at least six times PolitiFact has rated some variation of this claim, once even rating a version True. In case the slight of hand was too subtle, we'll explain: PolitiFact stands by the Half True rating of "If you like your health care, you can keep it." What they're rating Pants on Fire is Obama's new claim that his promise came with a caveat. This Pants on Fire rating is the one listed in the Lie of the Year finalists, not the widely known claim that if you like your health care, you can keep it. If we accept Holan's claim that "If you like your health care, you can keep it." is indeed a Lie of the Year finalist, then she needs to reconcile that with the original Half True rating. Can something that is Half True simultaneously be the "most significant falsehood of the year"? Holan was the editor on both ratings. It's reasonably assumed she knows what she's writing about. A glance at the "Lie of the Year" announcement shows that all other finalist claims are listed in bold. Only in the "If You Like It" case does Holan choose bold font for a tangentially related claim, and further on identifying the actual finalist. It defies credulity to justify this as a mistake. The implication is that Holan is making an attempt to confuse readers as to which claim is actually being nominated. The bottom line is PolitiFact included this claim to save face. The "Half True" for "If you like your health care" resulted in an embarrassing exposure of PolitiFact's ineptitude. This is another attempt to make up for it. Don't be fooled. They've stood by the "Half True" rating for years and to this day refuse to acknowledge they are wrong. 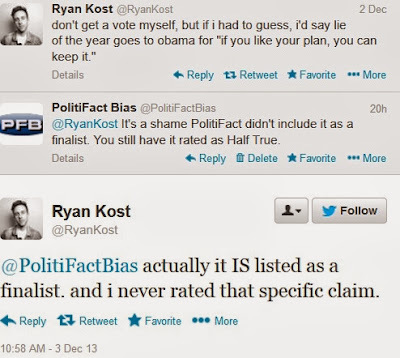 PolitiFact hasn't changed the rating and they haven't changed their tune. "If you like your health care, you can keep it." is not a finalist for Lie of the Year. PolitiFact still rates that claim Half True. Don't let them pretend otherwise. It's worth noting that the voting form uses the same format as PolitiFact's post about its LOTY readers' poll. The wording will strongly encourage readers (like "anonymous" in our comments section below) to believe they have voted for Obama's "you can keep it" promise from previous years. Note: I didn't vote in the poll. I just put a check mark next to it to help make clear the screen capture comes from PolitiFact's ballot page. It looks like the real fun will start when and if this item wins either the readers' poll or PolitiFact's official award. Will they say a "Half True" claim from last year won the award? Or make clear that the winner was Obama's 2013 follow-up fib? Or simply continue muddling around in the middle? It is on the list. It's the 5th selection. I voted for it yesterday. You were the victim of a bait and switch. We tried to warn you.